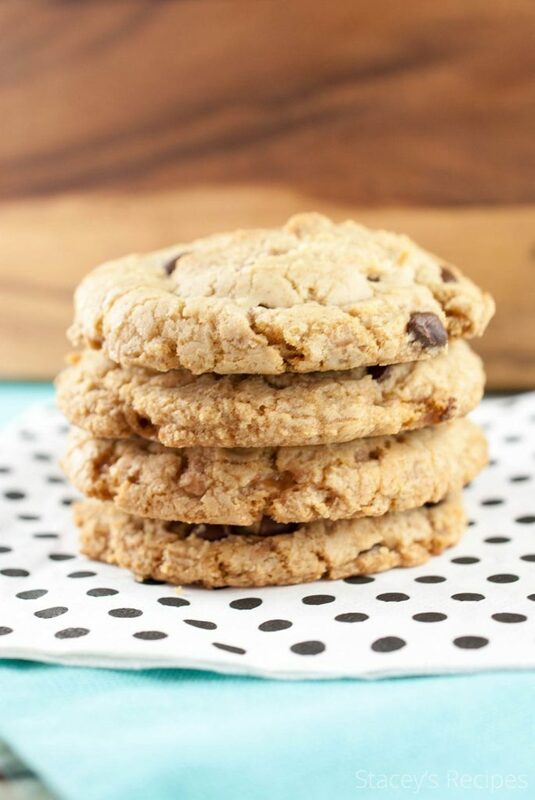 Soft and chewy cookies bursting with chocolate chips and toffee pieces – a perfect cookie for those who love Skor bars. Happy new week to you, that is if you consider leaving the weekend in the past and starting a new work week happy. Either way, I have the perfect way to brighten your Monday. 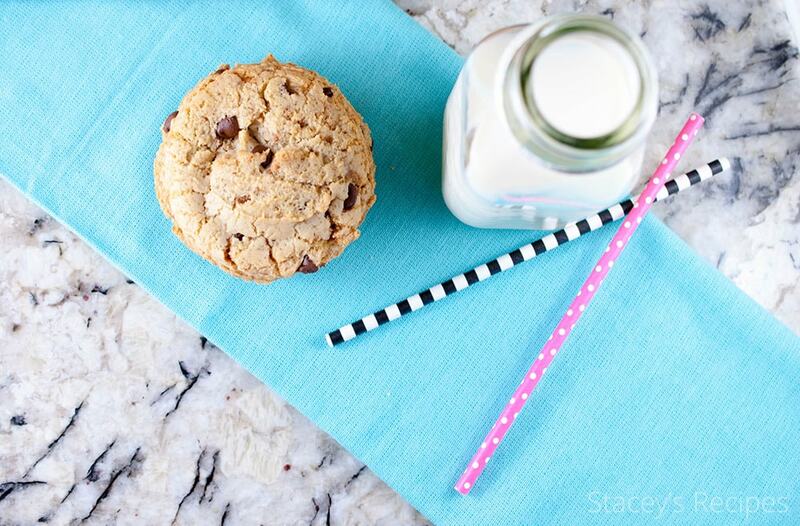 It all starts with a cookie.. is there any better way to brighten your day? I didn’t think so. This recipe has been sitting in the back of my head for months, while I was walking through bulk barn and came across these Skor pieces. I’m not sure if you have skor bars where you are, they’re also called Heath bars. Anyways, Skor is one of my favorite chocolate bars, along with crunchy.. because how could you not love sponge toffee covered in milk chocolate?! 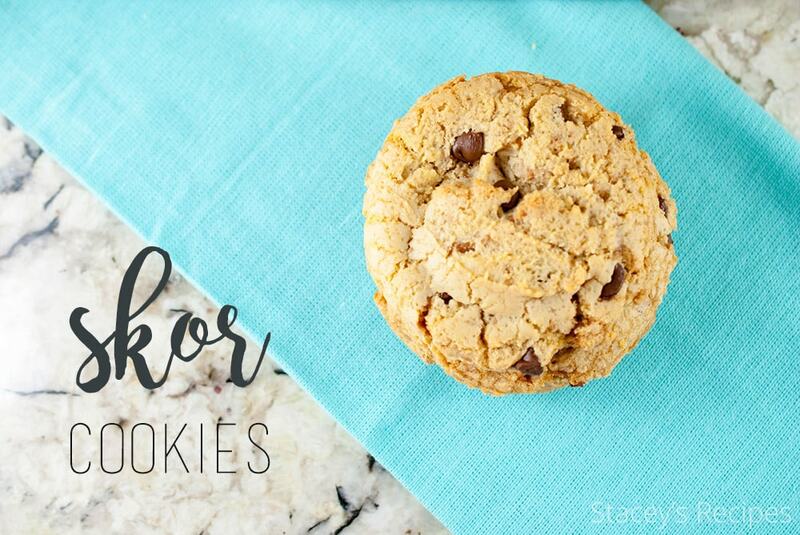 These Skor pieces make the perfect match for my chocolate chip cookies. Once they are baked the toffee pieces gives the cookie a slight crunch. If you’re new here you’ll need to know that I love my chocolate chip cookies chewy, slightly under-baked and with crispy edges. Oh, and filled with plenty of chocolate chips. You’ll want to be sure to chill your cookie dough for at least 2 hours, otherwise you’ll end up with thin crispy cookies. I like to scoop my dough before I chill it. If you’re like me and have tried multiple times to scoop out cold cookie dough you’ll know it never goes as well as one hopes. It doesn’t help that I’m way too impatient to wait for it to come back to room temperature. When the cookie craving hits, there is no time to waste. Oh, one last thing I like to use semi-sweet chocolate chips in this recipe as I find the milk chocolate a bit too sweet for me mixed with the toffee pieces. 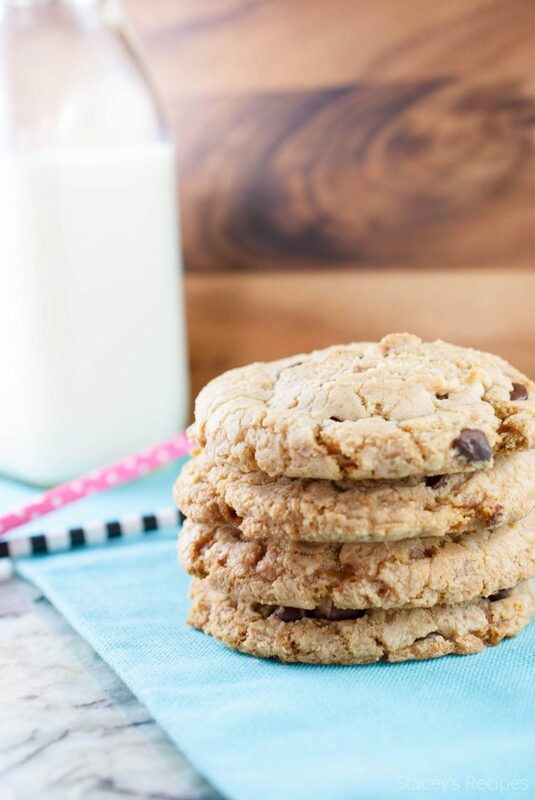 Get a tall glass of milk ready, these cookies won’t last long! Pour the wet ingredients into your dry ingredients and stir with a wooden spoon or spatula - the batter will be pretty thick. Fold in your chocolate chips and toffee pieces. Scoop your dough in about 2 tablespoon size balls. Cover your dough and chill in the fridge for 2 hours, or overnight - chilling is mandatory as it will help keep your cookies from spreading thin. Remove your dough from the fridge and preheat your oven to 325 degrees. 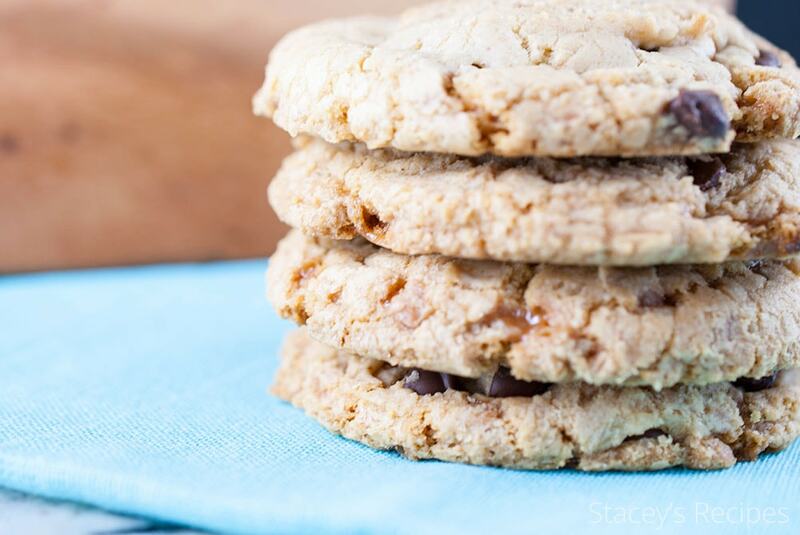 Line your cookie sheet with your Silpat or parchment paper..
Bake the cookies for 12-14 minutes - they will look under baked but they will continue to bake on the cookie sheet once they've been removed from the oven. Once you've removed your cookies from the oven you can press a few extra chocolate chips into your cookies to make them extra pretty.